Whey protein is a bodybuilder’s best friend, no doubt. Not only does it provide a healthy dose of easily-digested, quick-acting amino acids (which are needed to build muscle), but it also delivers an energy boost. Whey protein is the perfect pre- and post-workout food, as it will help you to get through and recover from your workouts more effectively. Finding the RIGHT whey protein, however, can often be easier said than done. There are literally hundreds of supplements available on the market, all with their own unique pros and cons. Thankfully, there’s one whey powder that seems to stand out from the rest: CLEAN Whey by Bulk Supplements. If you are looking for a pure protein source, then this could be the one for you. It’s not without a issues, so be sure to check out my “cons” section, but if you are looking to build lean muscle mass, this could be the whey for you. 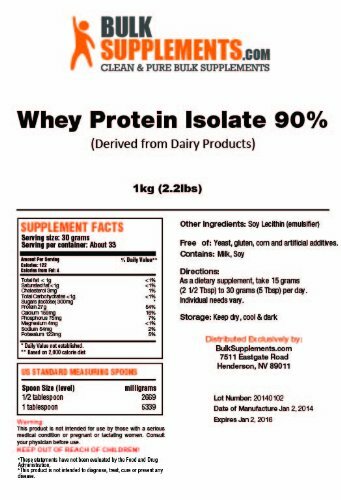 CLEAN Whey is a whey protein isolate. Simply put, this means that it is a highly concentrated form of whey protein, but one that has undergone a lot more processing than whey protein concentrate. Note: While you do get more grams of protein per serving with whey protein, they are more likely to contain artificial ingredients and chemical fillers. The whey protein powder is cold-filtered, which reduces the breakdown of amino acids from the whey during processing. Amino acids make up 90% of the bulk weight of the powder, and it delivers a very high concentration of protein–more than many competing whey protein powders on the market! Not only does it contain the nine essential amino acids needed to build muscle, but it contains Branch Chain Amino Acids (BCAAs). These amino acids make up 66% of the protein used during exercise and are the most important for lean muscle repair and post-workout recovery. Thanks to the high-protein formulation of the supplement, you get everything you need to push yourself hard and recover from your workout more effectively. It can also help you with weight gain and can be used as a weight gainer if you supplement with your diet effectivley. The protein powder is pure, clean whey. There are no unnecessary ingredients added into the powder. Soy lecithin is used to thicken the powder, but there are no artificial or synthetic ingredients, preservatives, or fillers. The supplement has been tested by a third-party laboratory in order to ensure that it is safe and pure. It is also manufactured in the U.S.
Amino acids account for 90% of the bulk weight of the protein powder. This ensures that those taking the supplement get the maximum benefits in terms of muscle-building, repair, and recovery. The supplement is unsweetened, and thus contains no sweetener–either artificial or natural. Minimal flavor — While some protein powders are heavily flavored to mask the “whey” taste, this supplement has minimal flavor. This means that it will not have a strong taste when mixed with milk or water. If you’re looking for something that won’t be overwhelmingly flavored, this is a great product to consider. You can still enjoy the taste of your milk, shake, or smoothie! There is not an artifical sweetener in this product, which means there is no horrible sweet aftertaste or dangerous additives in this product. Easy on the digestive tract — Whey protein powder is known to cause digestive upset for those with sensitive stomachs/IBS, but this product has been manufactured to be easy on the digestive system. Most reviewers report no negative side effects of taking the protein powder either before or after their workouts. Simple packaging — Unlike many other products on the market, CLEAN Whey comes with a simple package and product design. It doesn’t make promises it can’t keep or try to use “marketing gimmicks” to encourage shoppers to buy. The package contains only the name, logo, and the important nutritional information. For a simple, no-frills protein powder, this is one of your best options. Mixes well — The majority of the reviewers commented on how easily the protein powder mixed in with their milk, water, or smoothie. Even when using a Blender Bottle instead of a blender or food processor, the protein powder combined nicely with the liquid. There were few complaints of grainy, gritty texture with this CLEAN Whey protein powder. Personally, the grit wasn’t bad for me. About what you’d expect. Unpleasant flavor on its own — While most reviewers commented on the minimal flavor of the whey protein powder when mixed with other ingredients, a number reported that the powder ALONE with milk or water has an unpleasant taste. Personally, I noticed this as well, but I wouldn’t call it “unpleasant” just very bland. This means that you will need to mix the powder with fruits, chocolate, peanut butter, or other strong-flavored ingredients in order to enjoy its flavor. No seal — While the product claims to come delivered in a factory-sealed Foil Zip Pouch, a number of reviewers complained that the bag wasn’t factory-sealed, and the bag doesn’t seal once opened. This can be quite the hassle, as it can make a mess in storage and may actually cause the protein powder to degrade. Others have reported that their bag was cut open, or the bag was damaged in transit. Poor customer service — Most of the complaints regarding CLEAN Whey dealt with the company’s poor customer service. When clients tried to contact the company regarding issues with the state of their purchase, but Bulk Supplements either took a long time to deal with the problem or never got back to the customers. This is NEVER a good sign! TGS Nutrition 100% Whey Protein — If you prefer the unflavored protein powders (which mix well with juice, water, and milk), this is an excellent option for you. This 2-pound bag costs just $30, significantly cheaper than CLEAN Whey. It is an eco-friendly option, and one that mixes VERY smooth in shakes and smoothies. NOW Foods Whey Protein Isolate — For those who want good value, this is definitely one of the best whey protein isolates around. A 5-pound tub goes for $58, and the product is 100% pure, micronized whey protein isolate. It’s packed with BCAAs, and is unflavored with no sugars or artificial sweeteners added. It’s thicker than the average protein powder, making it a handy addition to foods as well as drinks. Source Organic Whey Protein — If you want something 100% natural and organic, you’ll love this unflavored whey protein powder. It’s definitely the priciest of the lot–$32.50 per pound–but it’s pure, organic protein powder made from grass-fed California cows. It’s free of hormones, chemicals, pesticides, sweeteners, preservatives, colors, and flavors. Despite the high price tag, it’s as clean and natural as it gets. CLEAN Whey is a high-quality whey protein isolate that packs an amino acid punch! The fact that it’s flavorless means that it will blend well with a wide range of foods and drinks, making it a versatile protein powder. While the customer service leaves a lot to be desired, I haven’t personally experienced any issues (only from reading other reviews). Plus, you get more than HALF the amino acids you need every day. All in all, it’s a solid choice. If you, however, need more protein choices, click here to find the best protein powder for you. On Amazon: Check this listing here for the latest pricing. Buying Direct: Check out the BulkSupplements listing here for bulk discounts.